I could hardly believe what my computer screen was telling me. The Sunshine award?! Getting this just made my day. 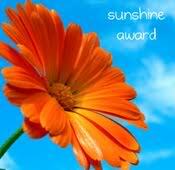 I was so excited when Amanda from TheCilantropist passed the Sunshine Award on to my blog, so a big thank you to you Amanda. If you haven't seen her site, you should check it out immediately. I'd re-Sunshine her if I could, but I think she's already recieved it twice. You'd know why if you checked out her wonderful creations and her beautiful pictures. As part of the award, I'm supposed to pay it forward to some of my favorite blogs. Lauren's Little Kitchen... because it makes me laugh and I feel like I get her. It's good writing. It also is nice to hear about sunny California when I'm sick of Virginia. Hungry Meets Healthy...because Christina is my newest blog friend and ADD just like me. She is silly and hilarious and makes a lot of messes in her kitchen, too, not that I'm biased. A Pear to Remember... because I met Lindsey in a class for grad school and she introduced me to her blog full of healthy beautiful food that makes you feel better just looking at it. Bittersweet.... because Rick is crazy about sweets and although I've never tried any of his, they never fail to surprise me. A different sort of "sunshine," maybe, but he always comes up with something fun. Anecdotes and Apple Cores... because even though Monet has won several awards already, I'm on the bandwagon. Reading her blog makes me feel at ease. I can never wait to see what comes out of her oven next. Cookin' Canuck...because Dara's got some bangin' recipes that I'd love love love to devour. She also has step by step photos, which is nice if you often mess up steps, like I do. I read several other blogs all worthy of praise, but I have to run! Hope you all have a fabulous weekend, and I'm sure I'll be posting soon!! Congrats! I hope the smile you got from this award brightens your weekend. Congratulations on your first blog award! It is so nice to be recognized by your peers! Congrats on the wonderful award and I'm so happy to see Monet on your list there... Her blog is wonderful! Congratulations! Well deserved...you have a lovely blog. Congratulations! What a great start to the weekend! Why thank you. That is so sweet of you (no pun intended). I love your blog so much too. I am honored by your award! You are such a sweetie! I'm so glad that I found your blog, and I'm honored by your sweet words. You are one of my favorites! Congratulations on the award! Makes me smile too!